Propane autogas is the complete alternative fuel solution for your 2019 Ford F-450 chassis cab when it’s outfitted with the ROUSH CleanTech fuel system. This clean-burning vehicle lowers operating and fuel costs, and cuts emissions with zero loss in horsepower, torque and towing capacity. After your dealer places the order with Ford, the vehicle will be built and shipped from the assembly line at ROUSH CleanTech or one of the authorized ship-thru facilities of your choice. It is then placed back in Ford’s transportation system for delivery to the next receiving location. The ROUSH CleanTech fuel system is certified to 0.02 grams per brake horsepower-hour. This engine is 90 percent cleaner than the current EPA’s most stringent heavy-duty engine standard. 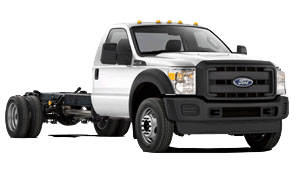 The Ford F-450 chassis cab equipped with the ROUSH CleanTech propane fuel system provides the same great performance, horsepower, torque and towing capacity as the gasoline powered counterpart. In any altitude or extreme weather condition, you can depend on this fleet vehicle to provide reliability and performance. ROUSH CleanTech maintains the factory Ford 5-year / 60,000-mile limited powertrain warranty on vehicles equipped with the liquid propane autogas system. Contact ROUSH CleanTech for information on extended warranty options. The ROUSH CleanTech propane autogas fuel system is covered by a limited 1-year / 12,000-mile warranty when installed on a truck that is no longer covered by the Ford factory warranty. By incorporating propane autogas Ford F-450 chassis cabs into your fleet, you will be helping America achieve energy independence because this alternative fuel source is domestically produced. Converting your fleet to propane autogas will also help your company to turn a greater profit by saving you on the bottom line costs of fuel and maintenance. You will increase customer loyalty because your customers will appreciate you providing them with a more environmentally responsible way to receive your products or services. Measurements based on a Super Cab with 60″ CA. Other cab and CA options available.